Figure 15. Sol 820. Green algae, stromatolites, microbial mats, or unusual abiotic sediments? Photographed by the Rover Curiosity Mars Science Laboratory Mars Hand Lens Imager which takes color images of features as small as 12.5 micrometers and at distances between 20 mm and infinity and having a depth of field of 1.6 mm to 2 mm. 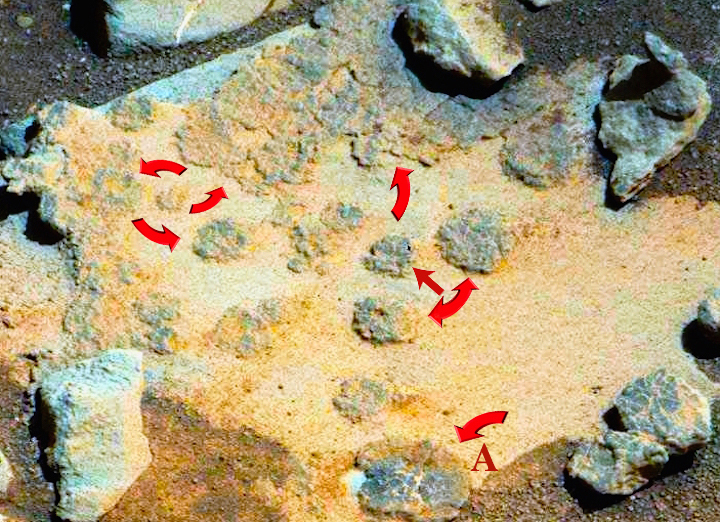 That image doesn't look like a MAHLI image, anyway, so there might be something fishy going on. I think you are right. You can't get false color like that from a MAHLI image, it looks like a MER image. I will have to go back and see if it is labeled wrong. ETA - I believe the image should read - Figure 17. Microanalyses of a Martian stromatolite (top) photographed by the Rover Curiosity (Sol 506) compared with a terrestrial stromatolite from Lagoa Salgada, Brazil (bottom). Highly organized microspherules and thrombolytic microfacies are common to both. Earthly Cyanobacteria typically form voids, intertwined filaments, and layer deformation within stromatolites. It is possible these formations were produced geologically in the absence of any biological influences. Looks like the descriptions of the 2 images are swapped around in the paper. of Algae,Fungi,and bacteria, and then some. for these speculations to hold merit. holds weight in small circles. but until now, have never mentioned it. Weird that a claim with some scientific legitimacy gets mostly crickets, but most here are likely more into looking at the ruins from the nuke war, heh.